Many builders and homeowners assume that green engineering will automatically cost more upfront than traditional home design and remodeling, but this is not necessarily the case. As with any professional services, construction becomes expensive when the business you hire to provide the service is not wholly familiar with how and where to acquire the appropriate materials and subcontracting. In the hands of a skilled and experienced engineer with longstanding relationships in the construction industry, such as the team at Precision Structural Engineering, sustainable construction is an extremely cost-effective way to build. 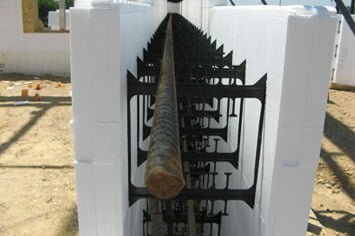 One example of a material that can provide tremendous functional and cost-savings benefits is the insulated concrete forms (ICF), which are foam concrete forms that interlock and are filled with rebar and concrete. These structures allow for a great deal of design flexibility, and are long-lasting, durable building materials that are growing in popularity among green home builders. While ICF may cost slightly more at the outset, the Insulated Concrete Forms advantages in construction provide a number of benefits over traditional concrete block construction. First, insulated concrete forms result in a building that cost less to heat and cool over the life of the building, due to superior insulation properties. The material does not decay and offers the occupant extremely high degrees of wind, fire, insect and impact resistance. Due to wildfires in the Western United States, specifically California, the popularity of Insulated Concrete Forms (ICF) engineering has grown dramatically in recent years. Despite the increased costs, the advantages and benefits of building a fire-resistant home really are endless. Learn more about how PSE can help make ICF’s below. See the many ways we have helped others by viewing our innovative and sustainable projects. Another alternative in wall and roof construction is the structural insulated panel (you’ll commonly see them referred to as SIPs). SIPs are constructed of oriented strand board frames that are filled with insulating foam. As with ICFs, structural insulated panel construction offers superior heating and cooling efficiencies, lower long-term operational costs, exceptional durability and design flexibility. Both ICFs and SIPs can be used with less site disturbance than traditional construction methods and result in a lower volume of construction waste. 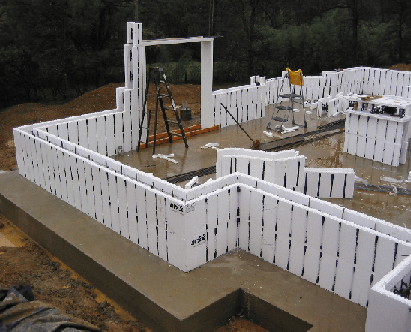 Why build with Insulated Concrete Form, ICF? ICF will provide up to 50% heating cost savings If you save $50/month, at 8% interest rate, How much do you think you will accumulate in 30 years? You will save $75,000! Fire Resistance: Non-combustible self extinguishing materials. Concrete will not burn. Non-compositable Can sustain flooding with no structural or mold damage.